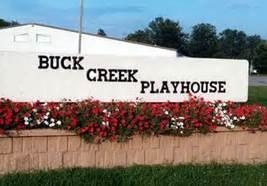 In 2001, Buck Creek Players moved into its current home, the Buck Creek Playhouse, at 11150 Southeastern Avenue. 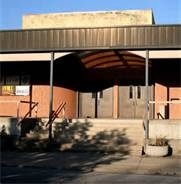 The current space was originally built as an indoor tennis facility that was later converted into a church. Much of the space was rebuilt to accommodate the productions it would now house. While increasing capacity, the space is still intimate, seating a maximum of 130 people. 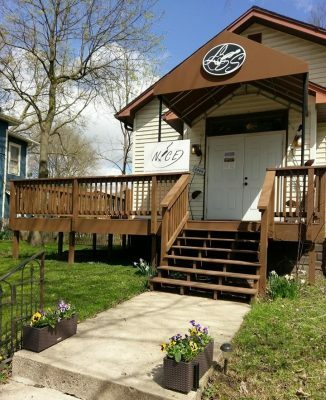 Whether you are planning your next business meeting, group presentation, art exhibit, networking event, film screening, fashion show, reception, or stage play, consider the new Carmel Community Playhouse. The possibilities are endless! The new Playhouse and Meeting Center locted at the south end of Clay Terrace in Carmel is an affordable, flexible-use space that can accommodate up to 120 people in either a theater seating arrangement. Room Configurability Wireless Internet Sound/Lighting Laptop Projector/Screen Staging *70+ Retail Shops 16 Restaurants On-site Catering * Custom configuration and staging options may be limited during theatrical production runs. 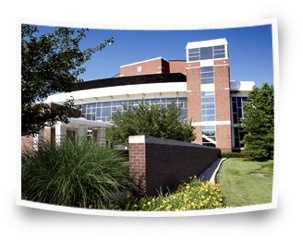 The Christel DeHaan Fine Arts Center houses the Ruth Lilly Performance Hall and Christel DeHaan Fine Arts Center Gallery. The Cook Theater, at the Indiana Landmarks Center, is a rich, all-wood space with a proscenium stage, accommodates up to 325 with flexible seating arrangements and adjacent meeting rooms. Originally built in 1928, the Fountain Square Theatre opened as a 1500 seat motion picture and vaudeville theatre. Decorated with an Italian garden theme and highlighted with a forty foot dome ceiling with twinkling stars, the theatre enjoyed many years as a premier entertainment venue. Closed and gutted in the late 1950's the former theatre space housed a Woolworth five and dime store, then years later a thrift shop. After extensive renovations beginning in 1994, the Fountain Square Theatre is once again transformed into a starlit courtyard. Columned arches surround an expansive dance floor at the foot of a large stage and a balcony overlooks the main level of the theatre. The Mezzanine level of the theatre retains much of its original architectural details such as stained glass windows and ornamental plaster reliefs. 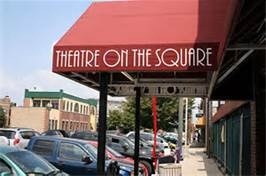 If you are looking for a unique venue to host your wedding ceremony and/or reception, a class reunion, dance, concert, or corporate function, the Fountain Square Theatre offers an historic setting for your event. This up-close 314-seat thrust-style theatre features a three/quarter-round design that places 79% of its seats within 5 rows of the stage (and none more than 8 rows away). The Upperstage is on the 4th floor and is accessible via the elevators in our right (or east) set of doors as you face the IRT's building. The IRT’s history has been enacted in two historic downtown theatres. The Athenaeum Turners Building housed the company’s first eight seasons. 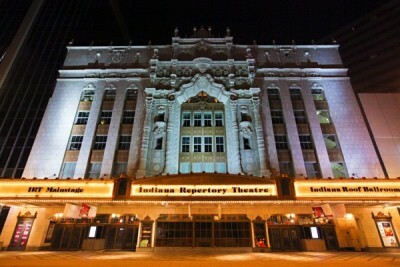 Since 1980 the IRT has occupied the 1927 Indiana Theatre, which was renovated to contain three performance spaces (Mainstage, Upperstage and Cabaret) and work spaces, reviving this historic downtown entertainment site. The company has recently renovated the Upperstage, the Cabaret, the Grand Lobby, and the OneAmerica Stage, completing a five-year project to upgrade the IRT’s audience support services as well as its theatrical production equipment. In 2009, the IRT completed renovations of its lobby and lower floor through its StreetFront Project, supported by Lilly Endowment. Newfields offers dynamic experiences with art and nature for guests of all ages. The 152-acre cultural campus features art galleries, lush gardens, a historic mansion, performance spaces, a nature preserve and sculpture park. From inspiring exhibitions in the Indianapolis Museum of Art Galleries, to concerts in The Toby, to a stroll through The Garden with a glass of cheer, guests are invited to interact with art and nature in exciting new ways. Newfields is home to the Indianapolis Museum of Art, among the ten largest and oldest general art museums in the nation; the Lilly House, a National Historic Landmark; The Garden, featuring 40 acres of contemporary and historic gardens, a working greenhouse and an orchard; and The Virginia B. Fairbanks Art & Nature Park: 100 Acres, one of the largest art and nature parks in the country. The Newfields campus extends outside of Indianapolis with Miller House and Garden in Columbus, Ind.—one of the nation’s most highly regarded examples of mid-century Modernist architecture. 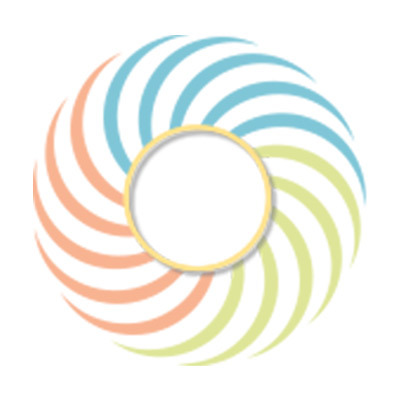 For more information visit www.discovernewfields.org. Located on Butler University’s campus, the Howard L. Schrott Center for the Arts is a hub for the musical and theatrical arts. The Strand Theatre has been a mainstay of the Shelbyville, Indiana cityscape since 1916. With the exception of the transition period beginning in the spring of 2005, the Strand has been in continuous operation since opening in the spring of 1916. It is the only surviving “old” theatre in the city limits of Shelbyville. They believe that they live in a community of wonderfully talented people. 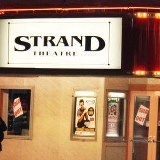 The Strand is a place to showcase the community for who they are and what they do. Shelby County has a proud history. The Strand is committed to helping citizens realize their proud heritage of the past, present and future. They believe that through the efforts put forth on stage, they can positively impact the quality of life for all citizens of the County. 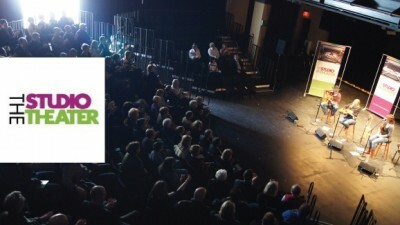 To do this, they are committed to bringing a variety of entertaiment to our theatre, while making it accessible for the novice to the professional. 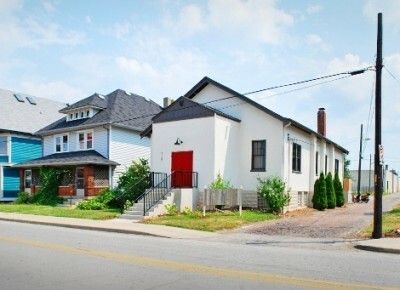 The Studio Theater is a flexible theatrical space intended to nurture local and national artists. In addition to the Center’s resident companies and their productions, the Center will present national performers. Look for cabaret, dance, comedy – the theater is an extraordinary addition to the Palladium. Conceived as a flexible “black box” theater, the multiple configurations are ideal for intimate performances. The theater has four seating/stage configurations: cabaret, proscenium, round and thrust. The flexibility provides resident companies the ability to stage concerts and theatrical productions. Additionally, the theater will be used as support and rehearsal space for both the 1,600-seat Palladium concert hall and The Tarkington 500-seat proscenium theater. The Studio Theater is across the Green from the Palladium concert hall and is adjacent to the Monon Greenway. 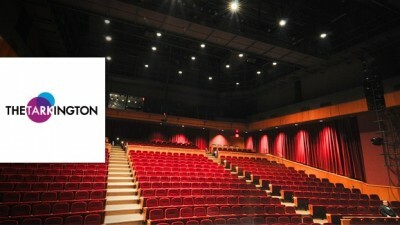 The 500-seat proscenium theater, named the Tarkington, is primarily used for drama, musicals, dance, lectures and variety presentations and completes the Center for the Performing Arts campus, which has become an inviting gathering place for the community. The Tarkington is located in the same building as the Studio Theater and is across the Green from the Palladium concert hall and is adjacent to the Monon Greenway. 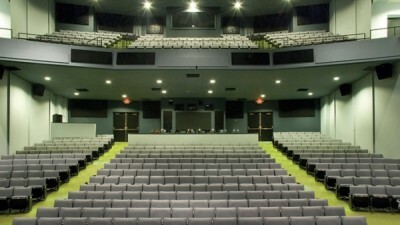 Tobias Theater, also known as "The Toby," provides a relaxing venue to view unique performances, expert-led conversations, special programs, and can't-miss movies. Called the "best screening room in Indianapolis," The Toby is a unique destination for films on the big screen, in high definition DVD or 35mm with surround sound. Catch classic, independent, international, or documentary films–including the IMA's signature Winter Nights series . 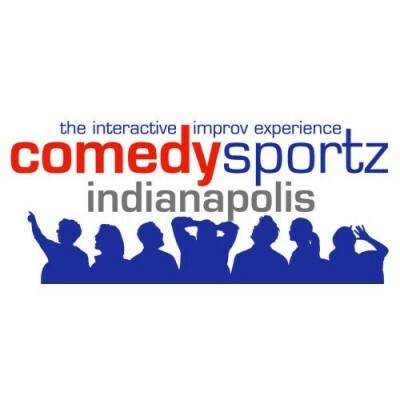 The Toby is also home to the Indianapolis International Film Festival, the Indianapolis LGBT Film Festival, and The 48 Hour Film Project. 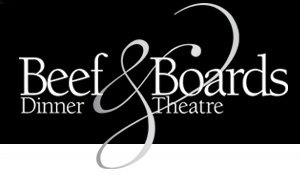 The mission of Main Street Productions of Westfield, Inc. is to create and present quality theatre which balances artistic vision and expression by producing theatre that involves, reflects, and nourishes the community it serves.